Cold Case is a highly innovative Left 4 Dead campaign developed by mrfranswa. It was released on Halloween 2009. Cold Case pits the survivors in yet another scenario. Their ride to safety has mysteriously crash landed on a remote island somewhere in the north western United States. After hours of waiting, they decide they are the only four survivors from the terrible crash, and they need to find help. However, quickly they realize there is something terribly wrong with this place. The survivors must traverse a large and expansive island. Their goal? To meet up with fellow survivors and get to the only known safe zone; a small military base located on the opposite shore of the island. Only there can they finally find the salvation they desperately are searching for…. or will they? During their journey, the survivors solve many strange mysteries that surround them. Why did their transport suddenly crash? Why are the infected on this island so quickly mutating? Who is The Mayor, and what role does he play on this island? Who is Agent Orange? It is up to them to find the clues and escape from the infested island. The infection is unstable and reactive. The zombies progressively become faster, tougher, and more aware of their surroundings through the campaign. Boss zombies also become more frequent. Expect to spend your time hunting for the upgrade tables. By doing so you can upgrade different things about yourself. Between accuracy, speed, and revival amounts you will need them to survive. Expect a rich and detailed storyline featuring numerous recordings by voice actors, (and myself). 10 survival maps with dynamically changing atmospheres. Hold some points while wave's of infected tear it down, while others force you to run for your life to get to better positions. 2 separate 5 map versus campaigns. 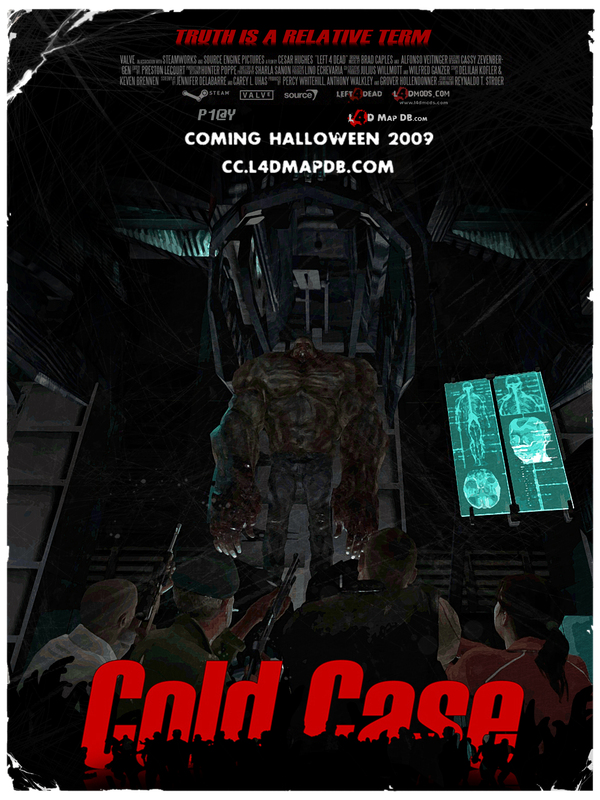 Cold Case: Covert Operations, and Cold Case: The Forsaken Each feature their own cooperative and versus maps! (l4d_cc1) - Basically a hyper-evolved dm_lockdownX2. This is the first map of the series, and will have the players traverse it very much like traditional L4D maps. This means basic Point A-to-B gameplay with only a few areas of item hunting and backtracking. (l4d_cc2) - The Overgrown Facility is an abandoned factory somewhere in the forest separating Liberty City, and The Prison. The survivors must traverse through a dense forest to reach the only known safe zone on the island. (l4d_cc3) - Known only as "The Mayors Residence" in recordings, a lot of strange activities have gone on inside the house. The survivors soon realize that one of their most deadly adversaries is not the horde. (l4d_cc4) - Things start going down hill for the survivors, and the futility of surviving the horde's onslaught becomes more apparent. Here the players will explore the shipping district of Liberty City. This section of the city is on the outskirts of the town, and is the last known quarantine zone left within the city. (l4d_cc6) - A secret map that you can only play by completing the entire campaign in succession, and finding all of the clues on the island. Will you finally solve the case? Can you ever except this reality? (l4d_vs_ccco1) - The Specialized Retrieval Squad has landed in a forest outside of Liberty city. It is their goal to reach the first safe house located in an old abandoned facility located not far from their position, (cc2). (l4d_vs_ccco2) - The SRS squad has received detailed instructions on where to find their target. The survivors trek through a dense forest. Features a crescendo event. (l4d_vs_ccco3) - Now the team needs to search for some provided transportation to the secret labs. The players must traverse the dangerous quarantine zone in search for the only known way to this facility. (l4d_vs_ccco4) - The team is within reach of its objective. They must work their way into the labs, retrieve the sample, and make their way to the core. (l4d_vs_ccco5) - Now that the team has their objective, all they have left to do is destroy all evidence it ever existed. The players need to overload the core, and make their way to the escape platform.